Mirbelia oxylobioides is an understory plant that flowers from mid spring to early summer. 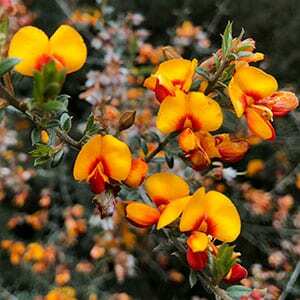 Very bright orange and yellow typical pea like flowers are the main attraction. It is found naturally in mountain areas of Victoria, New South Wales and Tasmania, and is under threat in Tasmania. Commonly known as the Sandstone Bushpea and Mountain Mirbelia this is species that possibly deserves a little more attention. The flowers are very attractive and these alone make it a garden worthy plant, however it is rare in cultivation. Being a natural understory plantMirbelia oxylobioides is best grown in a part shaded area of the native garden or general garden border this is an easy care plant once established. It will grow in poor soils and is a candidate for planting in the shade of taller native trees and shrubs. Flowers – Pea like flowers, orange and yellow.